simmer, stirring occasionally. Simmer until the mixture is thick, for about 20-30 minutes. 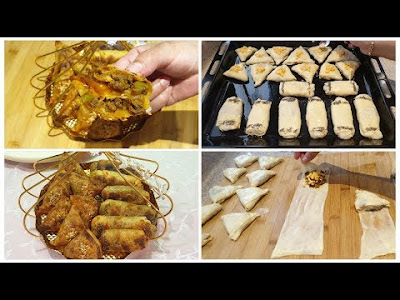 Remove from heat and let cool completely before using. This sauce can also be made a day or two before to save time. Refrigerate until ready to use. 2. Prepare the crepes. In a large bowl, mix together the eggs with sugar, vanilla extract and salt. Stir in milk, add flour and mix well. Add the oil and mineral water and whisk until smooth. 3. Heat a medium nonstick pan over medium heat. Sprinkle a teaspoon of vegetable oil or butter. Poor a small ladle of batter in the middle of the pan and with a circular move spread the batter to the edges of the pan. 4. Cook the crepe until the bottom is light brown. Flip over and cook the other side until light brown. Repeat with remaining batter. 5. Prepare the cream cheese filling. In a bowl mix the cream cheese with powdered sugar and vanilla until combined. 6. 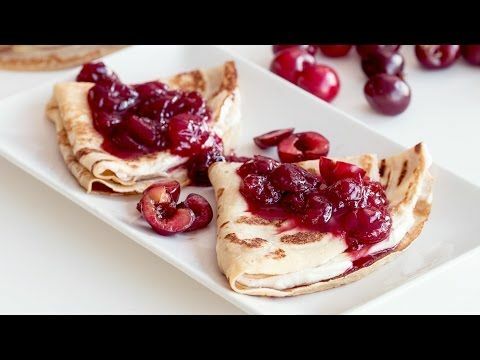 Fill crepes with cream cheese filling, fold and sprinkle cherry sauce on top. Serve immediately.